The things we do for women, I quit my job and moved to the Nashville area (Antioch) from Northwest Ohio. First time a move has brought far enough to impact the kind of weather I'm in year round. What kind of good public hunting is around here? I'm currently rethinking my wardrobe as I'm used to cooler weather starting in about 2 weeks and I hear tell you guys have summer through Oct pretty much ....it'll be weird seeing green in Nov I think. The Land Between the Lakes Wildlife Reserve, the Cherokee National Forest, and Hatchie Wildlife Refuge are all within driving distance of Nashville. There is also a big state park, in south central Tennessee, and a big state park on the interstate, west of Nashville, though their names escape me, that have good deer hunting. All of these places, though, are apply and draw special permit hunts, which are by lottery I think. Even then, they are crowded. Good news is, there are tons of deer in Tennessee, and it is generally easy to find a deer club to join for a fairly reasonable price. Some of them have as much as a 1,000 acres. There was an Article in the Memphis paper about 10 years ago, about a man who deer hunted with every possible special permit and on every legal day of hunting, with rifle, muzzleloader and bow. He legally killed 26 deer in one season. Deer do not generally run big in Western and Central Tennessee. 120 to 160 pounds is about the average, even for a large buck. There are larger deer in the mountains of East Tennessee, but I have never hunted there. If you are a squirrel hunter, then you are in luck. There are tons of squirrel everywhere in Tennessee, and very few people seem to hunt them anymore. You can hunt them on the public lands, which have lots of hardwoods, without much problem. Also, in the southwestern portion of Tennessee, there are now tons of turkey. Twenty years ago, Tennessee started a very aggressive release and restocking program in many areas, using birds trapped on the famous Ames Plantation in Hardeman county, and the comeback has been amazing. Look to the two large state parks I mentioned. Quail are few and far between. Chemical spraying, and planting to the edge of the pavement, have ruined them. Rabbit hunting is still possible, but you need a pretty big farm to hunt, and at least two dogs. There are plenty of beagle hunt clubs the last time I checked. The ability to walk up to a farm and ask for permission to hunt is nil. Everyone who has a place either hunts it himself, or has tons of relatives who want to hunt it. Tennessee is a deer-huntin, rifle tottin state. Never met a person who hunted deer with a shotgun. It is extremely gun friendly. As I have said before, the difference between a Tennessee liberal and Tennessee conservative, is that the liberal got his carry permit first, before buying his handgun. The conservative already had his piece. Rattlesnakes, copperheads, and water moccasins are huge issues throughout the woods and swamps of Tennessee. They are not rare, they are common. If you hunt in the early fall in the hardwood forests, when there are colored leaves falling everywhere, it is really hard to see a copperhead curled up at the base of a tree. They are virtually invisible. They aren't small either. So, don't think you can go into the woods to squirrel hunt or deer hunt and just sit down under a tree. Wear high leather boots, carry a folding stool, and make sure you carefully check and clear out the leaves in a 3 foot circle before you erect your folding stool and sit down on it. If you are a river person, and take a canoe down the Hatchie River in the fall, you will see the water moccasins jumping off the over head tree limbs and splashing down into the water. But, they are not just in the rivers and dense swamps. They are routinely found in and around any farm pond, and in any area where the ground is usually wet or not well drained. And, they are huge. Believe it or not, Memphis has a public rifle range in the city limits, at the old 2,000 acre prison farm, now called Shelby County Farm Park. The 100 yard section of the range was generally a little wet, with undergrowth growing up to the edge. I was there on a Saturday, when they found a huge moccasin, laying right in front of the target stands at the 100 yard mark. It was promptly dispatched and hung up on a pole at the firing line, as a warning to the shooters. Rattlesnakes. It is not uncommon for little gun shops and general stores, in central Tennessee, to have a wooden cage covered in wire mesh, or a big aquarium, in the center of the store, with a large rattle snake in it. There is always a little sign telling folks where the snake was captured, generally pretty close by. So, be constantly aware of the snake issue, and actually look for them on the ground when you walk in the woods. We have a great herd. There are very good public hunting opportunities including LBL, Yanhali, Yucchi, Ft. Campbell, AEDC and the coveted President's Island in Memphis that produces some of the biggest deer in the Southeast. I have found exactly one venomous snake on our 400 acres in 25 years. 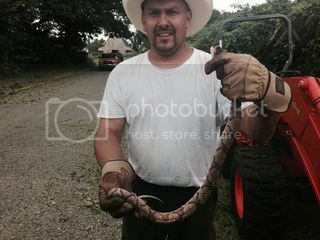 A big copperhead came out from under my buddy's bush hog two years ago. We snapped this shot then released him in an overgrown field. They are not aggressive, just watch where you step. The timber rattlesnake, pigmy rattlesnake and water moccasin are only slightly less common in these parts. It is unlawful to kill any snake in Tennessee unless it poses a threat to people, pets or livestock. And Piney campground at LBL, Long Hunter State Park, Fall Creek Falls and the Great Smokey Mountains Nation Park will provide plenty of awesome camping. Lots of smaller treasures here too. When I was last there, they only allowed bow hunting on President's Island, and it was only by lottery drawn permit. Maybe that has changed. Very huge deer though. And, you are sitting there, in the city limits of Memphis, looking at the downtown skyline and hunting massive deer. Very very neat.